Sony's TZ-Series have long been seen as some of the best business ultraportables on the market. It is now updated with the TT-Series, and while the Sony VAIO VGN-TT11WN/B (£1999 inc. VAT) carries a formidable price tag, it proves to be a truly stunning business laptop. The compact 1.3kg carbon-fibre chassis is impressively light and tough, and ideal for long-term travel use. The new sleek and curved design provides a stylish executive look. Even the thin 5mm screen panel is resilient, and its flexibility helps prevent cracking under pressure. The 609 minute battery life is one of the best results we've seen and effortlessly provides all day mobility. The battery can also be recharged to full power in just two hours, making it a great choice for the busy professional with little time back at the office. The 11.1-inch LED screen uses a wide 16:9 aspect ratio. This shows widescreen movies in their native resolution, and is also ideal for multi-tasking and spreadsheet use. The screen is sharp and bright, and the matt-finish ensures reflections are almost entirely eliminated. As with most of its latest laptops, Sony has used its so-called isolation keyboard design. All keys are cut through individual holes in the chassis to allow plenty of space between keys. The board is firm and responsive and very comfortable to use at a desk or on your lap. The ultra-low voltage 1.2GHz Intel processor ensures the chassis stays comfortably cool at all times, but also results in limited performance. All office tasks and even basic video editing tasks can be performed however, thanks in part to the impressive 4096MB of memory. Storage is also strong. The 160GB hard drive is ample for business use, and the dual-layer DVD rewriter supports all current CD and DVD formats. For maximum storage if your budget allows, this can be substituted for a recordable Blu-ray drive for £330 (inc. VAT). A built-in HSDPA module provides wireless broadband internet access on the move. It comes with 30-days of trial access courtesy of T-Mobile, but is not tied to this provider, so you can easily choose your own contract or use your existing 3G SIM card if you prefer. Extra features include a fingerprint scanner for protecting important data, and a built-in camera above the screen. Some users may feel cheated by the two USB ports, but it's an inevitable sacrifice on such a compact and otherwise well-specified system. 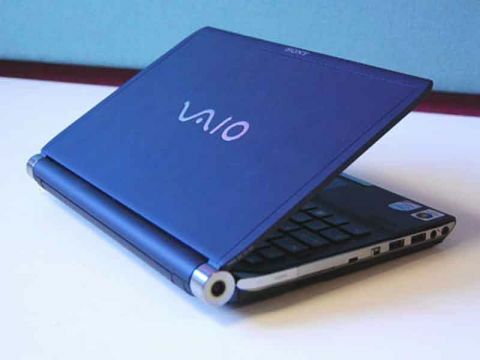 While the high price of the Sony VAIO VGN-TT11WN/B puts it into an elite group of ownership, its style, resilience, battery life and features make it one of the best ultraportables we've seen. This may well prove to be the perfect laptop for the frequent business traveller.